Language Evolution or Language Change? You sometimes hear people complaining about the use of the term “language evolution” when what people really mean is historical linguistics, language change or the cultural evolution of language. So what’s the difference? Some people argue that evolution is a strictly biological phenomenon; how the brain evolved the structures which acquire and create language, and any linguistic change is anything outside of this. Sometimes this debate gets reduced to the matter of whether there are enough parallels between the cultural evolution of language and biological evolution to justify them both having the “evolution” label. 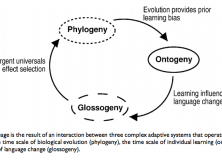 George Walkden recently did a presentation in Manchester on why language change is not language evolution and dedicated quite a large chunk of a presentation to where the analogy between languages and species fall down. It is true that there are a lot of differences between languages and species, and how these things replicate and interact, and of course it is difficult to find them perfectly analogous. However, focussing on the differences between biological and cultural evolution in language causes one to overlook why a lot of evolutionary linguistics work looks at cultural evolution. Work on cultural evolution is trying to address the same question as studies looking directly at physiology, why is language structured the way it is? Obviously how structure evolved is the main question here, but how much of this was biological, and how much is cultural is still a very open question. And any work which looks at how structure comes about, either through biological or cultural evolution can, in my opinion, legitimately be called evolutionary linguistics. Additionally, in the absence of direct empirical evidence in language evolution, the indirect evidence that we can gather, either through observing the structure of the world’s languages, or by using artificial learning experiments, can help us answer questions about our cognitive abilities. 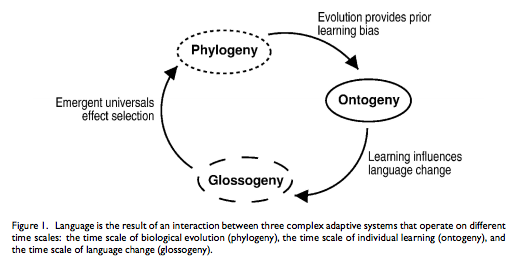 Furthermore, Kirby (2002) outlined 3 timescales of language evolution on the levels of biological evolution (phylogenetic), cultural evolution (glossogentic) and individual development (ontogentic). All of these timescales interact and influence each other, so it’s necessary to consider all of these levels in language evolution research, and to say work on any of these timescales is not language evolution research is not respecting the big picture. So what’s the difference between language change and language evolution? As with almost everything, it’s not a black and white issue. I would say though that studies looking at universal trends in language, or cultural evolution experiments in the lab, are very relevant to language evolution. What I’d label historical linguistics, or studies on language change, however, is work which presents data from just one language, as it is hard to make inferences about the evolution of our universal capability for language with just one data point. Figure 1 from: Kirby, S. (2002b). Natural language from artificial life. Artificial Life, 8(2):185-215. Hi Hannah. Simon and I laid out a way to think about the difference between language evolution and language change in our TiCS paper. (You even blogged about it! http://www.replicatedtypo.com/language-evolution-in-the-laboratory/1544.html) Having said that, although that distinction is a useful one, technically both are language evolution. Evolution just means that there is a system of relatively autonomous items of different types (e.g. different languages, or aspects of language structure) with the frequency of those types changing over time. This describes language change. At least it’s long and detailed. My favourite bit: “Biological change exhibits progression; there is no evidence for this in linguistic change”. Let me count the times critics have argued that cultural evolution is progressive while biological [sic] evolution is not. Of course language change is progressive. Just ask Ugg and Grog. Can you elaborate on this comment a little? I don’t see how it’s at all *obvious* that language change is progressive. The whole Uniformitarianism argument he seems to give in this talk is a bit misleading. Best line: “In the Palaeozoic there were no mammals. There are now.” So what? I could equally say ‘Prior to the emergence of chiefdoms and states, involved in long-distance riverine/marine trade, there were no trade pidgins or lingua francas’. It was only relatively recently in human history that these types of social structure existed (see here). Conversely, I can equally say there are never going to be any time-travelling moonbats. Biological evolution, just like language change, operates within constraints. Biology operates within the constraints of physical and chemical systems just as language operates within the constraints of cognition and social interaction. These constraints narrow the space in which evolution can operate. I agree that the argument seems a bit dodgy. I understood the mammals comment you mentioned to be alluding to a conceivable state of affairs where, at some point in the past, languages didn’t have verbs, or movement, or something along those lines, whereas now they do. Conversely, the evidence we have suggests that core grammar has remained pretty much static. Well, there are grammatical theories that argue for language-specific grammatical categories and against universal, pre-established categories (e.g. Croft’s radical construction grammar and Haspelmath’s paper on pre-established categories.) I’m not necessarily wedded to these perspectives, but I don’t think it’s a cut and dry story that the core grammatical system has remained static. Even if it were the case that grammatical system is static, we could say argue the biological system is static in that we are all carbon-based lifeforms. Just a FYI – the link appears to be broken. Agreed, it’s a question of degree, not a clear-cut distinction. Of course, the biological system is in a sense constrained by a number of different factors – we could talk about a ‘universal grammar’ of organisms, if we wanted to. Linguistic systems are constrained too – it’s an open question what exactly is responsible for the constraints. I imagine that what George was alluding to is that the space for variation in linguistic systems is *surprisingly* small, given some minimal assumptions about how cognition works. It does seem to me wrong to establish a dichotomy between biological evolution and language change on that basis. I looked through it. I don’t see many criticisms of cultural evolution from linguists. Overall, this one reminds me of the ones from economists. Critics in particular narrow domains systematically miss the big picture. It isn’t just language that evolves along Darwinian lines, its culture, ideas, somatic cells – and many other complex systems. That’s a criticism of genes and genetics! So: because genes and genetics are so useless, memes and memetics must be similarly useless. It should be clear that the flaw in this argument is that the premise is wrong. I’m not criticizing genes and genetics or suggesting that they’re useless. I’m alluding to the units of selection problem: the above-mentioned references argue against the gene-centred perspective (again without criticizing genetics itself). My understanding of memes (and please, correct me if I’m wrong about this or other things!) was that Dawkins proposed them as units analogous to the gene. But then if the gene-centred perspective on selection is problematic, so is the meme-centred perspective on selection in cultural evolution, surely? This is a very old controversy. My position is that both organic and cultural evolution are progressive. In both cases, the systems involved started simple and grew more complex. Empirically, discoveries about how to degrade energy gradients accumulate over time, faster than they are lost – in both organic and cultural evolution. Evolutionary progress is ubiquitous. Even Gould acknowledged progress – though he down-played its causes. For more, see my http://originoflife.net/direction/ essay, or Kelly’s recent book “What Technology Wants”. Language is progressive too – like most other cultural phenomena. It is false to say that there’s no evidence for this. Thanks for this thoughtful discussion, Hannah, and for linking to my (rather polemically-titled) talk from last year. I should probably clarify a few things. A more accurate title would be “Why Language Change Is Not Language Evolution, Unless The Term Evolution Is Used In A Very Weak Sense, In Which Case Language Change Is Trivially Language Evolution”. It’s actually the latter conception that I spend most of the talk discussing, in the form of Croft’s use of Hull’s approach. I really have no problem with that, except when people pretend that it’s telling us something interesting that we didn’t already know. In that respect I’m just taking the stance of Sober and Lewens (cited in the slides) with respect to cultural evolution. And it seems to me that almost all the interesting things that have been discovered about language change have come from linguistics, and have no obvious analogue in other domains: the regularity of sound change, for instance, or grammaticalization. Terminologically speaking, though, I prefer to refer to the cultural evolution of language as “language change”. Referring to it as “language evolution” has the danger of blurring the lines between ontogeny and glossogeny in Hurford’s sense. So what is the evidence, then? Genes are *important*, it seems to be widely recognized. However, some think they are more important than others – and the geneo-phobes like to describe the geneo-philes as being overly “gene centric”. Perhaps in *some* cases they are right – but either way, it seems more like a matter of emphasis than some genetics-shaking problem. Language started simple and became progressively more complex over time. Simple beginnings are a common feature of practically all theories of language origins. Growth of vocabulary continues in modern times, and is documented in dictionaries. Language evolution has also been boosted by the Flynn effect (better educated speakers), by the population explosion (more speakers), by networks (more opportunities for communication) and by computers (new types of speaker). Language change qualifies as “evolution” – according to most definitions of the term. In biology, “evolution” is often defined as being a process that results in heritable changes in a population across multiple generations. Even if you reject the idea that words form a “population”, it is hard to dispute the idea that language changes represent heritable changes in the population of word users. The more usual issue is not whether language change qualifies as evolution, but whether language evolution conforms to Darwin’s principles – or our best formulations of them. I don’t have time to reply to this in the detail it deserves, I’m afraid (maybe someone else will). I’ll just say that the comments here put you at odds with more than a century’s work in historical linguistics. That doesn’t of itself mean that you’re wrong, of course! But you might be interested to read up on why so many people disagree. The “species” criticism seemed irrelevant to me. It’s widely acknowledged that most world languages aren’t very reproductively isolated any more. There’s a similar situation in genetics of bacteria – which have largely-distinct “kinds” – but aren’t very reproductively isolated either. People sometimes call these “strains” rather than “species”. The situation with horizontal gene transfer is not significantly different between cultural and organic evolution either. Horizontal word transfer might be more common than horizontal gene transfer in the genomes of advanced vertebrates, but such creatures share genes in another way – by exchanging viruses and bacteria. That process is very similar to what happens in culture. Words get shouted around the host population, while viruses get sneezed around it. The viruses are often less welcome to their hosts – but apart from that the difference between the dynamics of these processes is relatively minor. Indeed, models drawn from epidemiology were used in the 1970s – when geneticists first started to formally model cultural variation along Darwinian lines. When people compare organic and cultural evolution, advanced plants and animals are often what spring to mind. However, much culture isn’t at that stage yet. Cultural evolution has only just got going. It’s working on building large cooperatives, but in many cases is still in the “swarm” mode of operation that characterized organic life on earth for its first two billion years. So: people should often be thinking of memes as being more like the genes – in viruses and bacteria. Critics seem to systematically miss this point. The reason for this is that people who miss this point often fail to develop sympathetic interpretations of cultural evolution – and so turn into critics. I don’t agree – my comments are perfectly compatible with historical linguistics. However: note that the evidence for evolutionary progress is not confined to linguistics! Progress is widespread in evolutionary systems, from plants, fungi and animals through to social and cultural evolution. It is ironic that in this era, of such *massive* and *unmistakable* cultural progress that we have so many progress denialists around. Hi Thom, thanks for the comment, you’re right, I completely forgot that paper went into this problem. I’ll give it a re-read. I wouldn’t be so quick to write off some types of language change as having no obvious analogues in other domains. Grammaticalization, for instance, has clear analogues in ritualization as noted by Haiman (1994) and Bybee (2003). We can also see some parallels between some aspects of grammaticalization and biology, such as Hopper’s layering and functional redundancy through gene duplication. I do share some of your scepticism about pushing the similarities too far, but there are points of similarity where *both* disciplines can learn from each other — theoretically and empirically. A recent example is a paper by Baxter, Blythe & Croft (2008) which evaluated Trudgill’s (2004) theory of the emergence of New Zealand English. Not only did they evaluate Trudgill’s claims, but they also added to the theory — all under an evolutionary linguistic framework (and some fancy mathematical modelling). Of course it’s about politics, at least I can’t imagine any uncontroversial definition or measure of ‘cultural complexity’ as you seem to be using it. If your argument is based on energy gradients alone (as implied above) then maybe it would be more uncontroversial if you talked about the *products* of biological and cultural entities that are undergoing evolution, rather than the *entities* of biological and cultural evolution themselves? Since you also seem to be using ‘directed’ and ‘progressive’ interchangeably, I find it interesting to note that cyclic changes, while certainly directed, are not progressive, or would you disagree with this? Complexity isn’t nature’s maximand, but we do have some pretty good proxies for it – in form of thermodynamic metrics. Better ecosystems increase entropy faster and reduce free energy faster than inferior ones – thereby gaining resources at the expense of competitors. The principle applies to culture too – with fusion-based systems out-competing fission-based ones, for example.